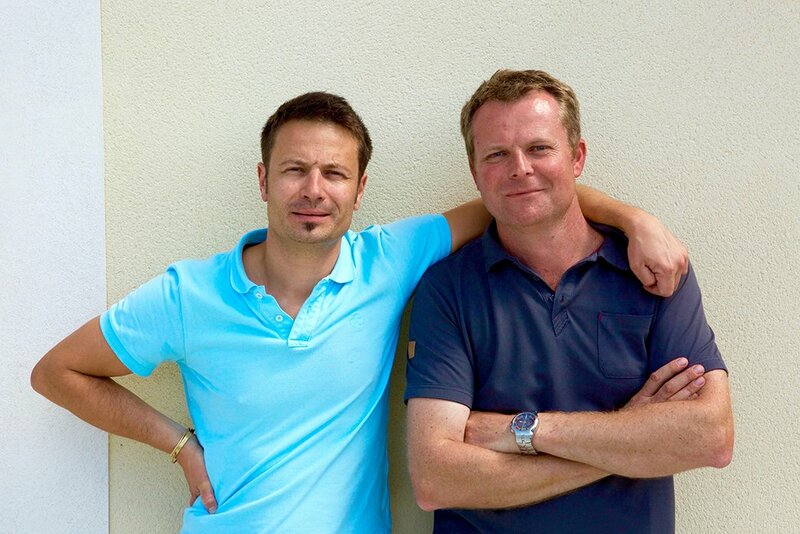 David Risoul (left) and Emmanuel Gagnepain (right), two consulting enologists in France, decided to start a new and unusual project with some of their vignerons in 2014. It was a simple idea: buy grapes from the best organically farmed sites at a few of their top producers, make the wines in the producer’s cellar and have it raised and finished according to their ideas and then bottle it at each domaine. Manu and David purchase their own barrels (all 500 liter), select each parcel and manage the wine with Manu’s monthly visits to the estates. The vignerons love it because they get to compare their wines with those of another project with fruit sourced from their same vineyards that they farmed. But one of the caveats is that the specific source of the fruit remains anonymous to us—la belle inconnue! Emmanuel (Manu) Gagnepain is a well-known name among vignerons (and US importers) in France. He is the consulting enologist for more than 70 domaines (more than 90% are certified organic or biodynamic) and made famous by his influence over many of the greatest producers in Corsica, like Abbatucci, Vaccelli and Stiliccionu. The style of southern French wines he prefers is elegant, mineral and pure, and this is what can be expected from the wines bottled under this label. Manu is also the partner at Les Vignerons Parisien, Paris’ new, and only winery. 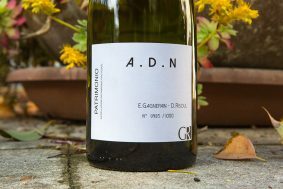 When talking about David and Manu’s project, it’s hard to be regionally specific because it spans from cooler regions of the Southern Rhone Valley all the way to Corsica. They love to play wherever there is something worthwhile and they have the means, including willing vignerons with great vineyards, to do it. So we will cover the regions from where we import, separately. First, let’s talk about a place that stole Manu’s heart: Corsica—yes, that beautiful island made mostly of granite with a renegade population that loves to terrorize foreign nationals if they buy a vacation home and overstay their welcome. It’s not hard to imagine the mistrust of this island’s people; they’re sandwiched between Italy and France, with the Italian island, Sardinia (another granite outcrop in the Mediterranean) within sight toward the south, and both have been fought over by every major military power of Europe in the last 200 years. Granite soil is the major geological feature for wine production on the island, but it also has some regions with a fair bit of schist and limestone, like the North’s Patrimonio, the home to Manu and David’s A.D.N wines. 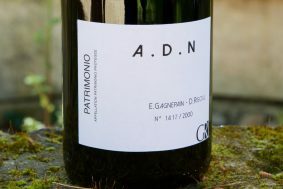 Their red Patrimonio is a blend of principally Niellucciu (believed to be from the same parent material as Sangiovese), a grape with good acidity and structure, with smaller amounts of the more elegant and high-toned aromatic, Sciaccarellu. 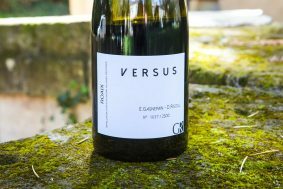 The white is made of Vermitinu (Vermentino in Italian, and Rolle in French) that comes principally from limestone soils. 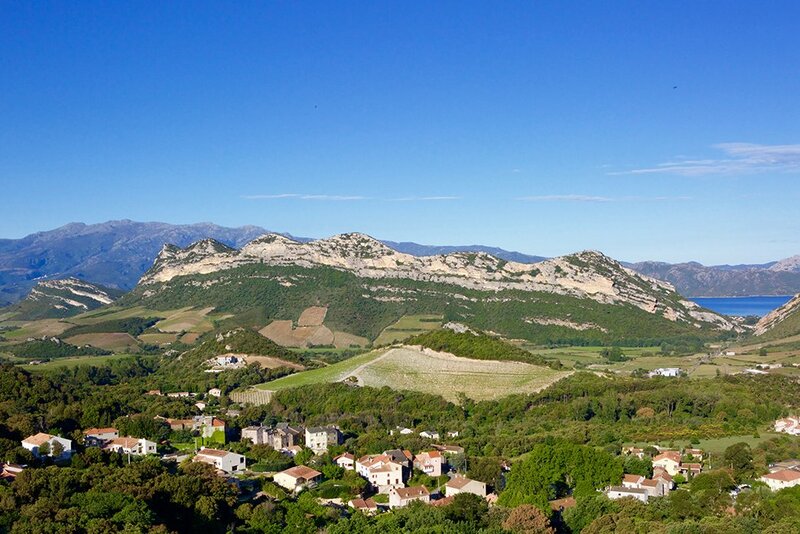 This region has a lot more limestone than most other parts of Corsica and this rock’s influence can make the whites more full and mineral, and the reds more masculine and powerful than the island’s southern wines, which are grown more on granite. The red wine VERSUS, from Roaix, in France’s Rhone Valley, is completely made of Grenache, a grape that we adore when it maintains lower alcohol and elegance, which this wine does. Manu’s mark on southern French wine is a reversal of the trend in the last 20 years of bruising power and alcohol. This is particularly exciting to us because southern France (amongst other regions in France) has been convinced that bigger is better. While other regions have figured out the flaw in this logic, the south continues to bow down to power in exchange for higher critical press. Manu’s wines prioritize elegance, perfume, acidity and precision above all and this wine exemplifies that spirit.